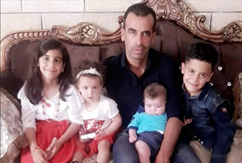 Union of Agricultural Work Committees (UAWC) condemns the murder of farmer Hamdi al-Naasan, 38, who was killed by a group of settlers on Saturday, January 26, 2019 evening near the village of al-Mughayyir, 22 km northeast of Ramallah. Twenty others were also wounded by live ammunition when defending their village from the heavily armed settlers, and some remain in critical condition. Nasaan was shot in the back and the bullet landed in his stomach, killing him instantly. Hamdi al-Nasaan, father of four, participated in weekly demonstrations against the confiscation of land for the construction of a settler outpost in the village, and against ongoing settler violence, such as uprooting trees, attacking residents, and confiscating their property. UAWC calls upon the international community to put an end to settlements, settlement expansion, and settler violence as attacks committed daily against unarmed Palestinians across the occupied Palestinian territories are on the rise. Targeting Palestinian peasants, peasantry families and agricultural workers who remain on their land working hard to secure their livelihood at the same time continuing their struggle against land confiscation, looting of resources, and the demolition of agricultural facilities which is a part of a systematic policy set to prevent farmers from accessing their own land. Yet, international law constitutes such policies a deliberate violation to human rights and it is a breach of the United Nations Declaration on the Rights of Peasants and Other People Working in Rural Areas. Settlers’ attacks, protected by the Israeli army, and the killings of farmers, will not in any way avert Palestinian peasants from defending their land and rights, and will not dissuade Palestinians from diligently working towards attaining their right to land and food sovereignty.